After the termination of the PMI Community of Practice website on the pmi.org, all the previous available recorded webinars to earn Category A PMP® PDU are nowhere to be found. PMP® Certification holders may find it hard to earn PMP® for their re-certification. Where can we earn PMP® PDU for free now? The answer is ProjectManagement.com! Detailed step by step instruction on how to get PDUs in the correct Tangle Triangle (technical, leadership, strategic) areas for re-certification. 2 Where are the PDUs recorded? When you first visit the projectmanagement.com, you will be able to find lots of webinars and resources with the red word “PREMIUM” meaning that the webinars are for “premium members” only. No, you don’t need to pay the membership fee at ProjectManagement.com in order to enjoy the premium member privileges. If you are a paying PMI member, you will automatically granted the “premium member” status at ProjectManagement.com! The most important one for getting PDU is the online webinars. By clicking “Education > Webinars”, you will be directed to a page listing out all the recorded webinars and upcoming live webinars. There are virtually hundreds of recorded webinars allowing you to earn the required 60 PMP® PDU for FREE. For the On-Demand Webinars, you can watch any time you want, by clicking the title of a recorded webinar, you will get to a page containing a brief description of the webinar, the webinar video player and nature of the PDU to be claimed, e.g. Watching this video allows you to claim PDUs. NOTE: You must watch videos in their entirety and all the way through to the end for our system to record your viewing activity accurately. For the Upcoming Project Management Webinars, you will need to go to the introduction and register for the webinar and attend the webinar as scheduled. Where are the PDUs recorded? You will be shown a lot of info about your account. Scroll down and find the section “PDU Awarded” and click on it, there all the webinars you have watched are shown, categorised by the Category of PDU you have earned (either Category A, B or C). It will also indicated which PMI Certification the PDU is applicable. The best part of this is that since your account is linked to your account on ProjectManagement.com, PDU earned in Category A will be reported to PMI on your behalf. The PDUs earned through participating in the free PMXPO virtual seminar will also be there. NOTE: All PDUs will be batched submitted to PMI on a weekly basis. You will just need to wait several weeks before you will be able to see the PDUs in your PMI account. After your PDUs has been approved, you will receive emails from PMI stating how many PDUs you have earned towards which certification (if you own more than 1 PMI Certification (e.g. PMP®, PMI-ACP®, etc. ), you will be able to get the PDU for several certifications at the same time). Earning PDU for your PMP® re-certification has never been easier before! By just logging in ProjectManagement.com and watch the webinars (either live or recorded), PMP® Certification holders will be able to collect the required 60 PDUs for their re-certification anywhere, anytime for FREE. 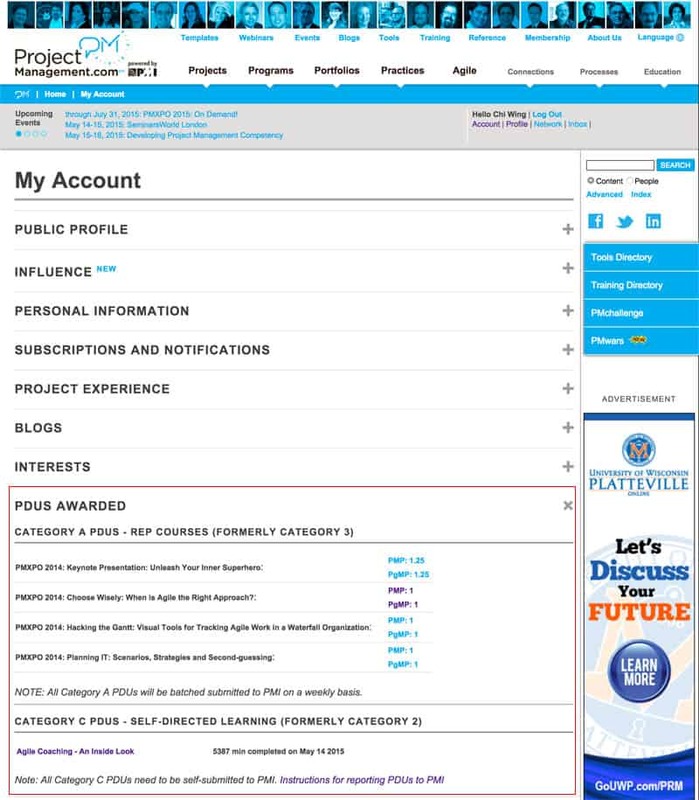 Note that you must be an active member (by paying the annual membership fee) in order to enjoy the premium member status on ProjectManagement.com. Next story PMP vs CAPM: How is PMP Different from CAPM? Thanks a lot Ed for your research and the information on CCR from PMP. 45 PDUs from Simplilearn/registered PMI training institute. This helps a lot!! I understand that I can earn PDUs from projectmanagement.com, however how do I know which area from the knowledge triangle I am earning a PDU. Does projectmanamgement.com guides you that the PDU you are about to begin belongs to this knowledge area of the triangle? Projectmanagement.com would report the PDUs on your behalf once you have finished watching the live or recorded webinar. They will help you to classify the PDU according to the domains of the knowledge triangle. Hope this helps.